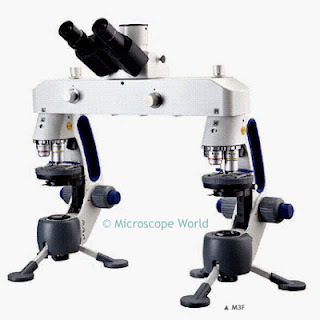 The Swift M3-F comparison microscope offers professional features at a competitive price point. Opaque objects can be viewed with the top LED illuminator and lower magnification of 20x. Large working distance provides plenty of room for bullets or larger evidence items. Microscopic specimens on slides can be viewed using the lower LED illumination and high power magnification of 40x, 100x or 400x. Images can be viewed 100% from the left microscope, 100% from the right microscope, side-by-side, or overlapping. Multiple stage positions allow for a variety of specimen sizes. Rechargeable battery operated LED illuminators provide the option for using the forensic comparison microscope in the field. The microscope includes a lifetime warranty. You can learn more about the Swift M3-F forensic comparison microscope here.